I’ve never been a big fan of grapefruit and the thought of chilled grapefruit with honey just didn’t do it for me this morning – so what did I do? I fired up the grill! Well okay I cheated a little and used my grill pan – this plancha is genius for indoor grilling – especially when you want those black grill marks. We are lucky to have a grapefruit tree outside my kitchen window – and it’s always full of fat juicy fruit. I selected a giant yellow orb with more care than usual, one ready for its close up and a couple of leaves still attached. I then sliced it in half. I just love that smell as I laid it cut-side down on the preheated hot surface. A little sizzle and a few minutes and just as smoke started to rise I knew it was done. For the honey I used Manuka – I love this thick tasty sweet treat and often eat a little straight off the spoon – it’s supposed to have all sorts of medicinal properties. 1. Heat the plancha over medium heat then place the grapefruit, cut side down on the griddle. Cook for about 2 minutes. 2. 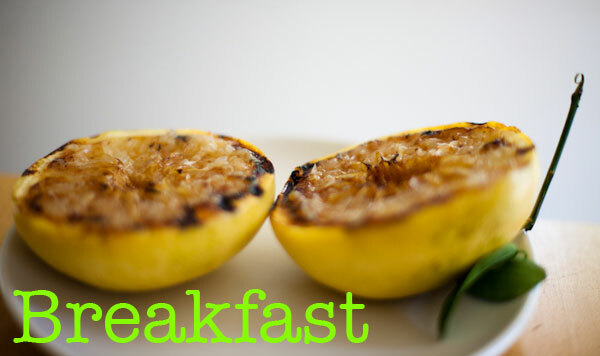 Transfer cooked grapefruit to a plate and melt the honey on to the fruit before serving. 1. Heat a large nonstick frying pan over medium heat. Add the olive oil and then the chicken. Let cook evenly for about 4 minutes on each side. Add the broccolini, the tomatoes and the red pepper flakes. 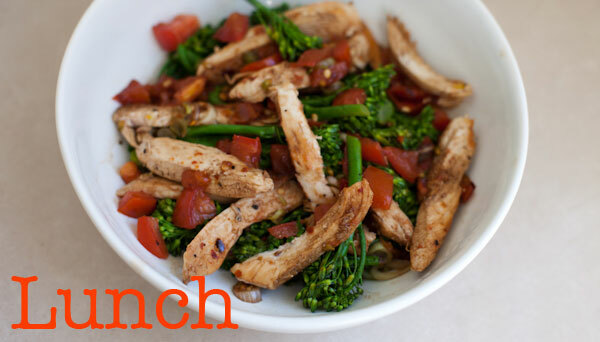 Remove the chicken breasts and cut into strips then return to the pan. 2. In a small bowl mix together the honey and vinegar and pour over the chicken and vegetables. Cook until the chicken is done and the ‘dressing’ has reduced. Chocolate Pudding on a Stick! (Should have been beets and oranges, but this is just too good and at Day 5 I needed a pick me up to keep on track.) Inspired by Matt Armendariz’s fab new book I put it on a stick and made enough for the whole family. 1. Melt the chocolate chips on the defrost setting in the microwave or over a double boiler. Set aside. 2. Place the chestnuts, cocoa powder, dates and coconut flakes in the blender and pulse to blend. 3. Add the melted chocolate and pulse to combine. 4. Add 1 cup of water to make a thick soupy consistency. 5. Transfer to 4 tall glasses and freeze for 30 minutes. Insert sticks into the center of each pudding, being careful not to go to the bottom. Return to the freezer for at least another 2 hours, until frozen solid. 6. To remove popsicle from the glass run glass under hot water for about a minute until it melts sufficiently around the edge to slide out. Don’t pull on the stick as it may come out. Enjoy! This was so good I ate it and forgot to take a picture! Oops! I was also in need of a proper meal to share with my hubby and as delicious as the salad suggested for Day 5 sounded we needed something a little more satisfying – so out came the garlic, ginger and beansprouts! 1. In a large non-stick saucepan heat the olive oil over high heat. Add the garlic, ginger and red pepper flakes and cook for 1 minute. 2. 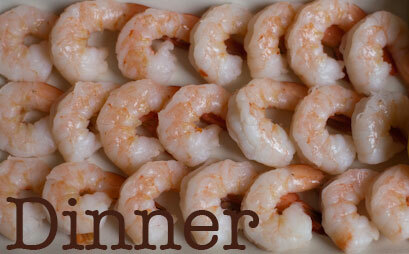 Add the shrimp, snap peas, hearts of palm and bell peppers and cook for 2 minutes, stirring as you go. 3. Add the beansprouts and the soy sauce and cook for a final minute before serving. « On a Stick! 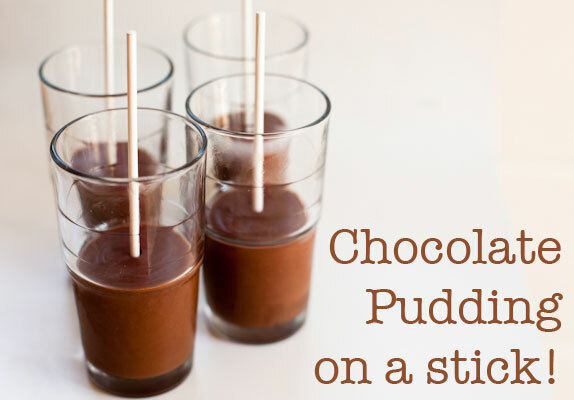 by Matt Armendariz inspires Chocolate Pudding on a Stick!